The panel of NAPA, Danelec Marine, ClassNK, and Inmarsat agreed that the main initial challenges for IoT adoption have been overcome. The panel met to debate the Internet of Things’ potential to reshape the maritime industry. TANKER Operator, among others, informs about the Danelec retrofit program on 30 medium-range product tankers. The original products which had been installed at construction were nearing the end of their service life and too expensive to maintain. With further installations scheduled in 2018, the first joint NAPA and Danelec Marine IoT cloud solution have already undergone successful sea trials on a vessel getting access to timely data from ships at sea. Danelec Marine has now released several conversion kits in order for existing customers to replace their current models of VDRs The conversion kits include new models of VDRs and S-VDRs, and are compatible with over 30 of Danelec’s existing tools. 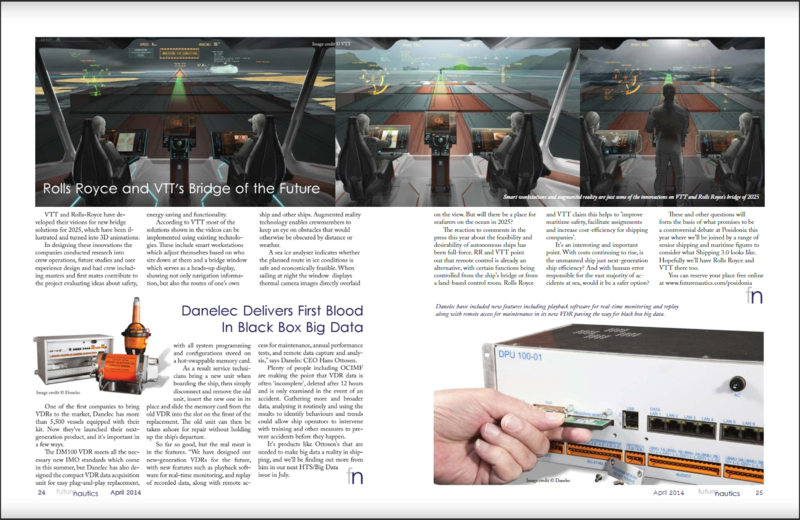 Renowned magazine delivering global maritime intelligence reports on Danelec’s comprehensive servitization strategy and its benefits to the maritime industry. Danelec Marine’s ECDIS, model DM800, has been approved as compliant with new industry standards that are taking effect. The certificate of approval was granted by DNV GL with EU Wheelmark. Danelec Marine and Maersk Line have penned a deal which sees Danelec installing VDRs and S-VDRs on Maersk vessels. The deal encompasses Danelec retrofitting technology on 100 existing ships. Denmark-based Danelec Marine is launching its third generation Voyage Data Recorder (VDR), built around an entirely new ‘concept’ to help vessel owners save time and cut costs.